A new bicycle touring magazine published its first issue today, and it’s free! Bicycle Traveler is full of stories from the bike touring world, plus gear reviews and some inspiring photos. It’s been edited and published by Grace Johnson, who’s currently in Nepal – the latest stop on an extended bike tour with partner Paul. 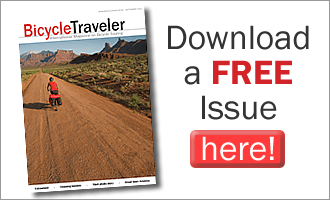 Go to the Bicycle Traveler website to download your free copy, and to subscribe to future issues. Registered as a member on the BicycleTraveller site. Joined ok, but cannot log in. No internet issues this end either. Anyone having similar problems ? First of all, thanks for subscribing to the magazine. Sorry about the misunderstanding / log in problems. By subscribing – you will be informed via e-mail that there is a new issue available and subscribers will also have access to all of the back issues via the log- in. At this time – there is only the first issue. Just downloaded it, really great e-magazine !! Just downloaded your new magazine and looking forward to my coffee break so that I can take a quick peek! Good luck with the future issues. One of the best reading I did in last few months. Most amazing fact is that it is published on the road! Thanks for the compliments; I will pass them on to the contributors! Brilliant production and great to see the variety. How can someone contribute an article? I find new contributors via the internet bicycle touring community. I’m continually reading guest posts on my favorite blogs, following web links and viewing photos in the flickr bicycle touring group. Whenever I come across great writing and/or photos, then the creator’s name is added to my list of possible contributors. When I start putting a new issue together – I contact people on that list to ask for material.